Advice Home > Tests > What Is An Emotional Intelligence Test Used For? Emotional intelligence is what we use to determine how we feel and how others are feeling. It's akin to empathy, but it's about being able to identify each specifically. It was first identified in 1964 by Michael Beldoch but was widely ignored by the scientific community. EI uses three main skills to identify any emotion - awareness, application, and management. By regulating, copying, and identifying emotions in others as well as ourselves, we can better relate emotions to experiences and act accordingly. As children we identify when it is suitable to cry and when not to cry based on our experiences; our emotional intelligence is underdeveloped, and by watching our parents and peers we improve it. It is often confused with simply being sensitive but being emotionally intelligence is a strength where sensitivity on its own can be a hindrance. Good emotional intelligence is being able to handle difficult situations well and social competence. These three terms are often confused, especially when it comes to tests because when people who are not professionals create them, they may not know the specific difference between them. Emotional intelligence is different from intellect and actual intelligence, and there's no connection between the two. You can have a high IQ and a low EI or vice versa but where most people are born with a rough level of intellect their EI can be developed to a higher degree of work. 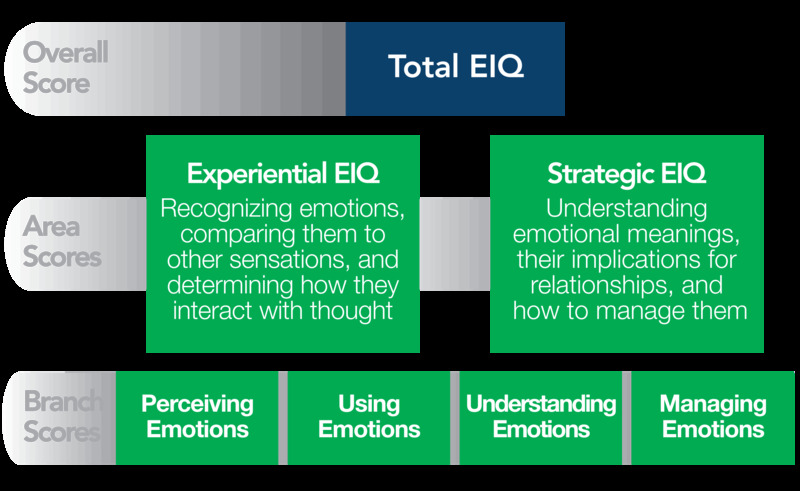 The EQ refers to the whole picture, but the terms of EI and EQ are frequently confused with each other. It is the sum of EI, IQ, and personality to make up the emotional quotient of a person and what makes them work. People who have a high EI tend to be better leaders, perform better at work, and have more stable mental health. While you're likely to find tests that measure all of the above very few of them have any use outside of psychology and airy "leadership" programs. Mostly these tests are used by companies to establish the right type of people to promote without really explaining if the people are talented or not in the position that they're in. It's not an exact science, and in many ways, the results are more pseudo-science than fact. They are limited in that they only measure EI without taking into account skill, ability, intelligence, or other traits which may be important. Since EI is only a measure of emotional understanding and competency, this could falsely be used to establish a person in a work position that they are simply not intelligent or skilled enough to be in. For the most useful test, you need a 360-degree assessment. This establishes not only self-awareness and self-regulation but also the views of others about your EI. By comparing the two, there's no way for a person to skew their results by lying and any inconsistencies will be easier to spot. For a leadership test, a 360-degree assessment combined with an IQ or personality test is the best way of establishing an employees competency and predict their effectiveness as a leader. The assessment by peers and co-workers is essential to understanding an employees EI fully and addressing any areas that may need improvement. Even if you're scoring well on an EI test as an employee, your test score can help you in the same way by potentially identifying areas you can improve on if you aim to get promoted. What shouldn't be presumed is that if you score highly on your EI test that you cannot improve. It isn't about being a perfect employee at all but about understanding where you can grow and develop as a leader without making assumptions. 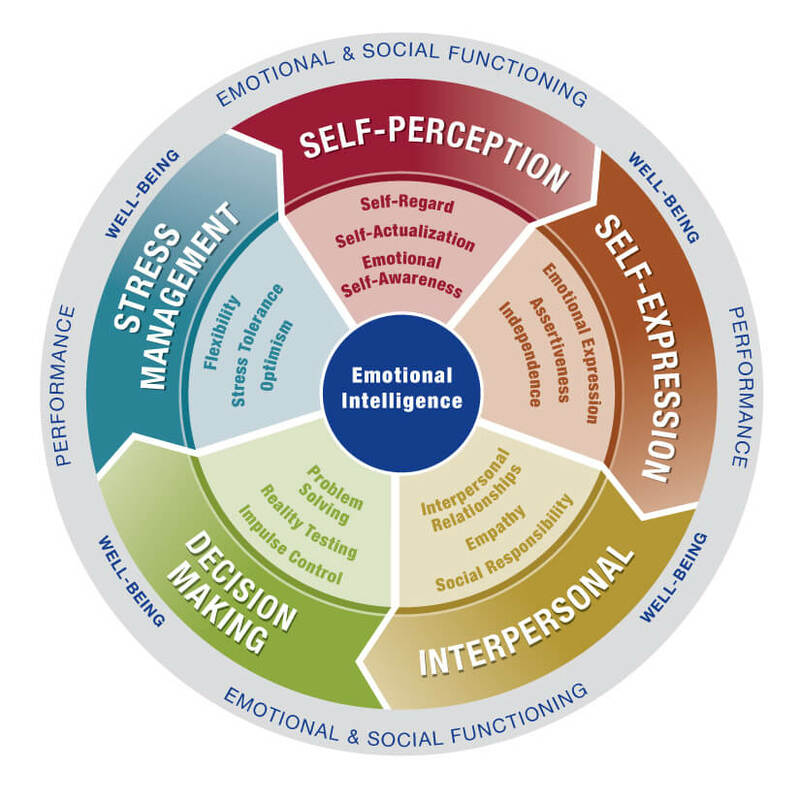 Measuring EI is usually done using the Mayer-Salovey-Caruso Emotional Intelligence Test. It is similar to IQ tests in design and measures the four branches of emotional intelligence with a score for each that are then combined into a total score. The test relies heavily on "social norms" which can obviously differ culturally which makes this test flawed when looked in a worldwide setting. There is an expert-scored version that was created by 21 researchers to give "perfect" responses and tests are scored against these answers in a comparison style even though there are technically no right or wrong answers. This test uses the "self-reporting" method in that it is wholly based on the person's perception of their emotional intelligence which can make the results quite flawed. The test originally had 141 questions, but 19 were removed after it was found that these answers were usually outliers and could affect scoring and accuracy. The test is usually used as an aptitude test to determine leadership aspects and employee competency for promotion. The system relates to motivation, the ability to motivate others, effective leadership, and empathy. There are two forms of this test which is much simpler than the MSCEIT. This is a diagnostic analysis of non-verbal accuracy. It requires identifying photographs of different people expressing emotions and being able to identify them based on their gender and intensity. This test can be administered in both a Japanese and Caucasian style test with between 24-56 different images shown to participants. The simpler tests limit participants to the seven emotions (happiness, fear, surprise, contempt, sadness, disgust, and anger) while the more complex test do not prompt participants at all, allowing them to create their understanding of the emotions being displayed. This test is used mostly by psychologists and medical professionals to determine a persons ability to empathize and understand emotion. It is not useful at all for leadership, and because it is quite subjective, it is harder to give "right" answers on. Each construct is not a talent but something that can be developed and cultivated by an individual to improve their emotional intelligence and potential as a leader. The model is frequently criticized as having no basis on actual psychology and having no real usefulness because of this. The mixed model has two different tests to measure EI based on these five constructs. 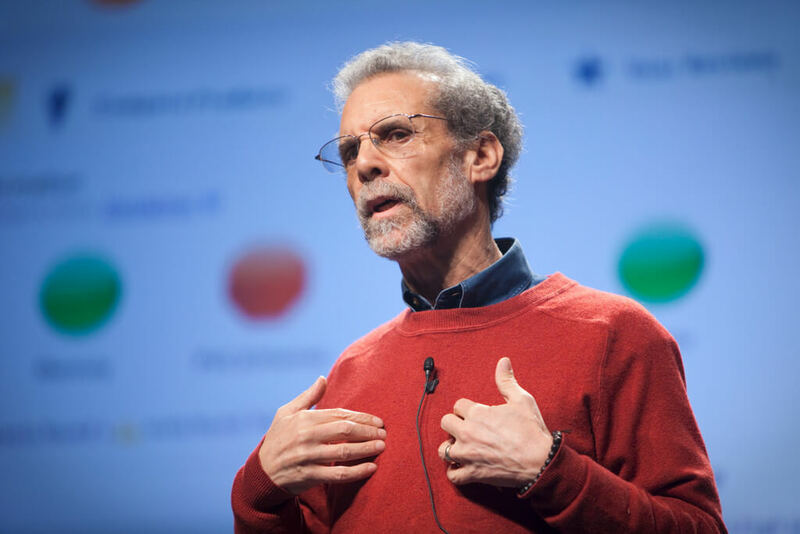 The Emotional Competency Inventory was the original test developed by Daniel Goldman to measure EI behavior. This test is similar to as Bar-On or EQ-i but differs as it focuses on learned capabilities rather than inherent traits. It was revamped in 2007 into the Emotional and Social Competency Inventory. This test is used to measure social competency and behavior in relating EI to others. This makes it most useful for employers who need to evaluate how their workers will work In addition to this there's the Emotional Intelligence Appraisal which is intended more for self-assessment and self-growth. As a tool, an EI test isn't very useful to psychiatrists. When dealing with emotional distress or disorders where people struggle to empathize the DANA test can be helpful in mimicry and in making patients more aware of how emotions and facial expressions are linked, but this isn't a common use for them. Overall, there's very little need for psychiatrists or other psychological sciences to use EI at all because it's usually quite obvious if patients are struggling with EI or suffering from a disorder that lowers their EI without needing a test to prove it. If you think you're suffering from a disorder which gives you trouble empathizing with society and others, then it's important that you seek professional help. An EI test is not a suitable measure of this, and as pseudoscience, the results may not have anything to do with an emotional disconnect. Contacting a professional who is knowledgeable in emotional disorders is essential in getting treated if you're not already in contact with someone. Sites like BetterHelp allow you to browse specialists based on their fields such as emotional disorders. The exception to all these tests is simple peer review. By using a third party peer to determine performance and ability the person does not have a way of influencing their results making them more accurate. Since EI relates to how others are perceived, it is only the third party that can validate if the subject is correct or not. It is possible for both 360 and self-aware EI tests to be biased which makes them less reliable. Choosing the right EI test often depends on what you need it for. If simple peer review is all that's needed an informal test asking coworkers about their experience may be sufficient while adding more formal tests like the 360 may help give a more rounded review. Ideally, these tests can be done together so that you can get the full picture of an employee.